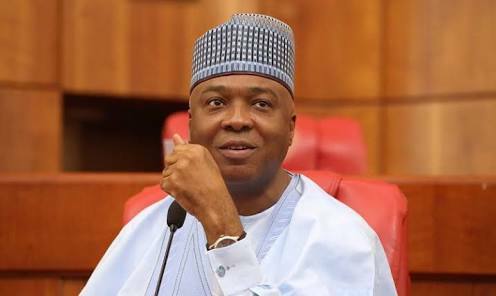 Senate president Bukola Saraki has stated that a large proportion of public office holders pretending to be helping the administration of President Muhammadu Buhari are actually enemies of democracy. Saraki made the remark at the senate in response to issues raised by Senator Dino Melaye who expressed anger over the news that he has to be charged to court by the federal government for allegedly giving false information to the police over alleged attempt on his life sometime last year. Dino Melaye who brought the issue to the attention of the Parliament under Order 43 of the Senate Rules, expressed defiance as he vowed that his planned arraignment by the Attorney-General of the Federation (AGF) and Minister of Justice, Abubakar Malami, would not deter him from criticising the Federal Government or any public office holder constructively when necessary. In his comments on the issue raised by Melaye, Bukola Saraki argued that the Federal Government taking Senator Melaye to court on the matter in question was not the way to go but insisted that the lawmakers would continue to speak out on issues they considered to be wrong in the society. He pointed out that some people in government were actual enemies of democracy while pretending to be helping the government, and stressed that members of the Parliament would continue to fight in defence of democracy and to ensure that the right things are done. “Senator Dino Melaye, your points are well noted and I do not see how the issue of arraignment can be a way forward in a matter like this but be that as it may, I want us all to continue to defend democracy and fight for what is right and I can assure you that this institution will continue to stand for what is right. “There are those who think that they are helping the government but sometimes they are doing things that are not in the interest of this democracy and I think they need to do what is right for the interest of all of us. But for sure, what is wrong is wrong and I think those who are looking at this will have a review and do what is right,” he said.